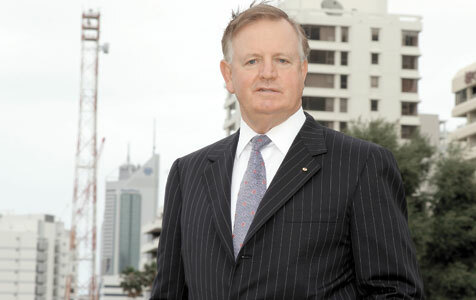 Leading property developer Nigel Satterley has hit back at claims the first home owners grant is a policy failure, arguing the grant has provided an ongoing boost to the Western Australian housing market. Good onya Saul, off course we should end negative gearing on property that would free up much of the established housing stock bought by "negative gearers" while reduce the median house prices in Australia creating greater affordability for Gen Y Australians currently paying $600 per week rent to greedy negative gearing landlords. I clearlt remember past PM John Howard publicly said on ABC TV news that he doesn't know anyone who is not happy that their house price has increased. He was obviously well out of touch with the average family in Australia who all have sons and daughters still living at home approaching thirty years olds because they cannot even find the deposits often $50,000 to buy a house. Sure my own home has trebled in price over 20 years because of inflation but I'd rather it hadn't as we all know inflation erodes our savings too. As the last of the babyboomers approaching retirement I maybe be considered asset rich but trust me I will be income poor with around $200,000 in superannuation (the current male average sum in Australia and much less for women returning 5% pa on average I can certainly look forward to spending my $10,000 income each year on cruises... dream on. More importantly I can see the day when Gen Ys will be both asset poor and income poor in their retirement because 30% of them are casual employees without job stability and super. The US and UK economies have never allowed negative gearing on property simply because this economic model actually fails whenever the majority of consumers take advantage of it as there would not be enough renters to fill such houses and as a result you can still buy a modest house in the US and the UK for AU$300,000 currently half the price of median house price in most states in Australia. As for the first home owner grant my Year 12 Economic students have argued each year since it's inception that it simply increases the value of houses by exactly the same amount on the basis that one goes to an auction factoring in their first home owners grant thus determining what they can afford to pay and bid. As a parent of university students graduating with $50,000 HECS debts (Nationally $30 Billion) which could have been a house deposit for each of them, my friends, colleagues and I can say to Mr Howard and the likes and any advocator of negative gearing that we would love to see house prices fall by at least 50% to a median of around AU$250,000 from the current AU$500,000 ($700,000 in Sydney) in Australia even if it means the four big banks reduce their combined $24 Billion profits each year by 50% they would still be making $12 Billion profit which is more than enough. Only then will consumption for Australian made more expensive products be stimulated otherwise Gen Ys /will be paying over 50% of their incomes for thirty years to finance an artificially inflated house value created by greedy negative gearing landlords who often own several properties who simply want to legally pay less tax. We are all aware that the top 25% income earners in Australia pay less tax as a percentage of their income than the middle two quartiles according to the ATO a clear case of the rich getting richer and the poor getting poorer in this "lucky country". Do the politicians actually realise that over 80% of the vast mining profits made by the big miners Rio, BHP etc leave the country no wonder Norwegian oil and gas engineers are laughing at. In Norway there are no Gina Rhineharts worth $8 Bllion or Twiggy's as in Norway the state owns the resources as it should be in Australia and only then we will all benefit form the mining boom before its too late otherwise like Holden, Ford and soon to be Qantas economic decline will surely result already reflected in our poorly performing All Ords sitting at 5300 still down 30% from its pre-GFC peak close to 7000 back in 2008 over five years ago while the FTSE in the UK and DJ in the US have broken new heights in recent months compound this fact with 30% of all 18-24 yr olds being out of work in Australia at present I can safely say "we ain't seen nothing yet" unless we build more public housing for them state and federal govts will be short lived as the unemployment rate rises in Australia and interest rates tipped to increasethis year as reported on ABC this morning. Happy Australia Day! tax payer funded contributions to land developers must cease! The first home owners grant is primarily a taxpayer funded indirect contribution to the land developers and profiteers in the real estate industry - we all know that. Over the past 5 years it has provided very little real relief to young west australians trying to secure a roof over their heads, whilst billionaires have emerged from land development and real estate industry exploits over the same period. This taxpayer funded wealth transfer needs to be stopped. Time to voice your request for urgent action to state & federal members for real relief (rein in profiteering on land supply/development) before we have a social mess unfold post the mining/LNG construction boom. Good point John....I spoke recently to an off shore mud engineer migrant from the UK who bought a two million dollar house in Applecross who received the first home owners grant because it was his first home owned in Australia. Glad to see our taxes are are helping the needy eh? Incidentally, he earns $230,000pa working for Chevron while his wife earns $90,000pa as a primary school teacher and his two kids attend Scotch College and PLC both costing $23,000 pa Close to 200,00 skilled migrants came to Australia last year many cashed up accountants,GPs and engineers like this bloke who all receive the FHOG which is not even means tested hence our name the "lucky country". Homeownership is falling in Australia and actually peaked during the 1960swith the first iron ore boom when the top marginal income tax in Australia was 60% Both Gina and Twiggy should pay 60% supertax on their profits and so should the four big banks jointly making $23 Billion profit each year and redistribute wealth in Australia as they do in countries like Sweden and Norway otherwise crime will continue to increase with unemployment and many more prisons will need to be built as the current prisons are already full and overcrowded an economic term aptly name by young economists the "Robin Hood" effect when the poor steal from the rich! Remind me why Alan Bond and many other white collar criminals spent several years in jail, their not exactly setting the best examples to the youth of the day who some day will be running our businesses when the rest of us are dead and buried. Do we even have death duties in Australia as is the case in the UK?